The one question I get asked the most is where do I get my wool felt. I thought I’d write a post about just that and hopefully get feedback from you guys and then have it all in one spot where I can send everybody. For whatever reason nice wool and wool felt seem to be specialty items and they aren’t readily available in most fabric stores (although JoAnn Fabrics does carry a few colors, their site says it’s 100% wool but I seem to remember that I’ve only found wool/acrylic blends there). The best places for wool felt seem to be quilt shops and sites that cater to doll makers, especially places that sell Waldorf doll supplies like the place I send people to over in my f.a.q., A Child’s Dream Come True. I’ve bought both the Spanish and the Holland felt from them and they’re both really nice. Purl Soho also has beautiful wool felt. Besides using wool felt for my dolls and toys I also use wool. It is softer and lighter weight than the felt and is just dreamy. I think the first wool I bought was one of these Marcus Brothers wool bundles and it was one of best craft purchases I ever made. Most quilt shops sell wool by the yard and now and then I have the sense to pick up a few colors when I’m in the shops. But now with even less time to make the trek to the quilt shops I’m trying to buy some online and wishing I’d paid more attention to what it was they had at the stores. I’m thinking maybe this? Moda Wool? But this site says it’s unfelted and I’m not sure what that means. Another wool that bears mentioning is the diy wool. Pick up some 100% wool sweaters from the thrift store and wash them on hot and throw them in the dryer and voila. Thick, fuzzy, awesome wool with the same great no-ravel edges. It makes awesome huggable soft toys. Then there’s wool stuffing. I know many people use it and it sounds wonderful. I still haven’t tried it out myself. I use polyfill that comes in little puffs and I find it so easy to work with (and cheap) and I’ve just stuck with it. They sell wool stuffing most places they sell materials for Waldorf dolls as well but it’s pretty pricey. Mimi was writing about a source for wool stuffing that sounded interesting. Might need to give that a try. So that’s what I know about wool. It’s not much, hopefully it’s some help. Please, if you have a favorite source you’d like to share I’d love to hear about it! Thanks for the leads on wool and felt. I agree, it can be frustratingly difficult to find sources for them. Though I don’t understand why!? One place I know of is http://www.jcarolinecreative.com. They carry both 100% wool felt and wool blends. They also have some pretty cute free tutorials/projects. Thanks Hilary! One other place that I’ve found for wool felt is http://www.weirdolls.com . 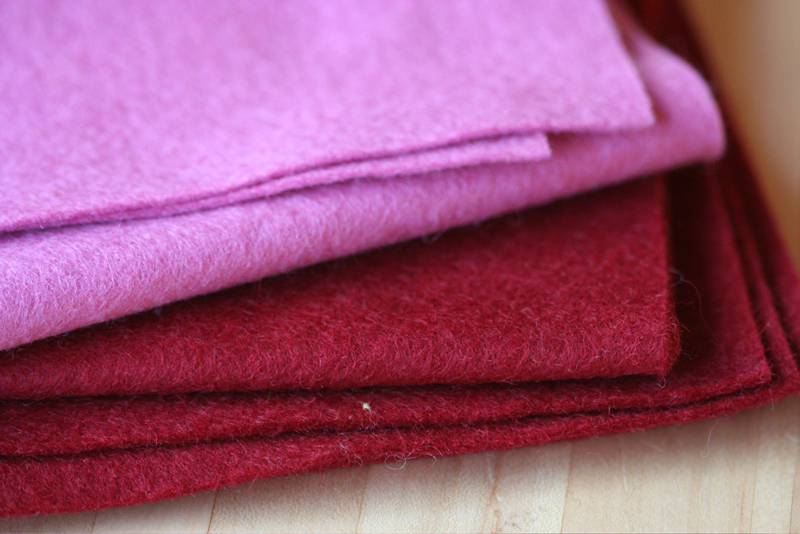 Sometimes they have scrap bags of wool felt for a great price – perfect sizes for when you just need a little of a different color. At JoAnn’s out here, the 100% wool felt isn’t located near the cheap felt. It’s usually on the other side of the aisle all the way at the end. I’ve bought it there and I really like it. Their colors can be limited but I try to pick up a color or two and use a coupon. i too love a child’s dream come true. i’ll have to look into the marcus bro’s site. i hate that it is so hard to find. Sewing supplies in general aren’t easy to come around here. And i do not like JoAnn’s. I do not think thirty-somethings are their intended audience. There’s something so satisfying about working with wool. It needles like butter. 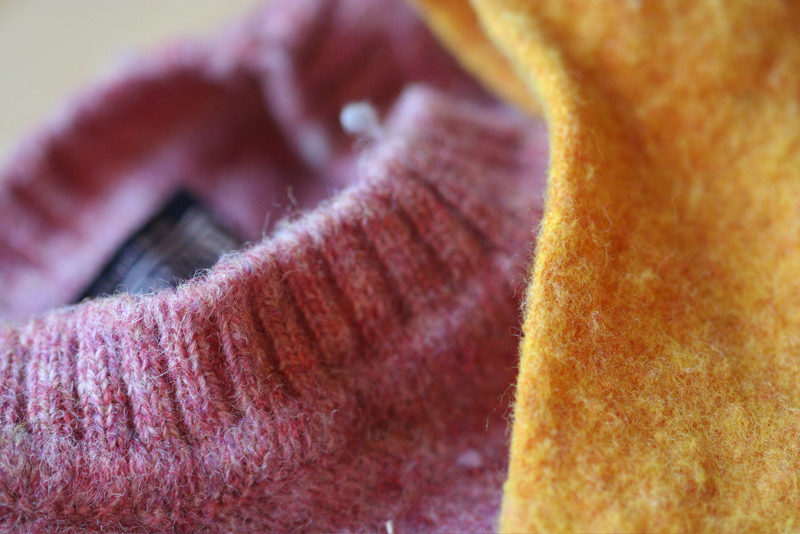 Wool yardage can be felted in the same manner as you described for sweaters. I am especially fond of felting 100% wool clothing I find at thrift stores. Skirts are best for easy to use yardage, but, if it’s a really beautiful tweed, I’ll even rip apart a blazer. Thanks for sharing! Your dolls & toys are always inspiring! I loved the felt I bought from a Childs Dream too…I actually used your recommendation! Where locally do you pick up the wool felt…I was ACTUALLY just going to e-mail you and ask…you know, I don’t want to wait around, although online purchases are really fast. I find that weirdolls.com has great wool stuffing and wool felt available in a variety of sizes. Also magiccabin.com carries both items. Thanks for your info – I hadn’t heard of marcus brothers before. You have to check the bolt end to know for sure (watch out for polyester sheep). So instead I’ve bought it from Intercal. It’s expensive, but very good quality stuff. Thank you for this info! I have been wondering where to get wool felt and I found weirdolls a few days ago and wondered how it was. I also saw some new Japanese felt at reprodepot and wondered about it, too. 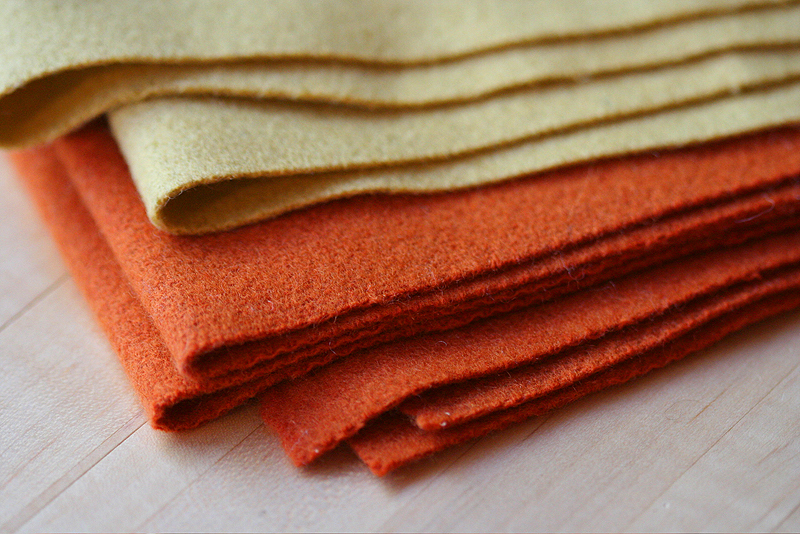 I never thought about felting wool fabric, what a great idea! Fishman’s Fabrics in the south loop has great wool fabric remnants. I like Marcus boiled wool for softies I want to stuff firmly because the fabric is woven and can handle rough treatment at the seams better than felt. Thanks for the link to that great color selection. I can feel more bunnies coming on. Those Marcus Brothers bundles look great–thanks for the link! Hallo, dear wool-lovers…I have been making lots of dolls and stuffies for my children and their friends, and I am always using 100% wool stuffing – it is a little more pricy, but also real easy to work with and just feels great inside the stuffed animals: the wool takes on and retains body-warmth from the little huggers, and that feels really great. You can find wool stuffing at online dollmaking shops, and it really goes a long way…I highly recommend it!! Thanks for the links, especially the Marcus Bros bundles…ooohhh! Thanks for the tips — I actually just received my first order of wool from A Child’s Dream Come True today, and it’s just lovely. : ) Thanks again! I live in NYC, so I’m all about Purl (purlsoho.com) for my hand-dyed felted wool, cotton floss and Nature-fil stuffing and Brooklyn General (brooklyngeneral.com) for my hand-dyed 100% wool felt, hand-dyed lambswool floss and wool stuffing. I also felt/full thrifted wool sweaters from Goodwill and the Salvation Army. There are some great sources on Etsy for felted wool scraps and mill-dyed felted wool as well. I use wool stuffing and order from Magic Cabin. When I lived near a Hobby Lobby in Santa Fe I would buy wool batting with their 50% off sales. It works the same and seems cheaper per pound than buying stuffing, go figure. I have not been able to find 100% wool batting at JoAnns, it has polyester in it. I also tried washing and drying the wool/polyester blend felt from JoAnns, very interesting results, sort of organic and lumpy looking. I just wish their colors were more vivid. Looking forward to the summary of your info! Thanks for this post (and comments)! It’s very helpful. I <3 the felt from Morehouse Merino. It's very soft and the piece they give you for $8 is huge. Weeks Dye Works hand-dyed wool is the best. Beautiful, soft, easy to work with. Tons of colors, and it is possible to order a small quantity to test out first. I have bought wool felt (both blends and %100 wool) from store called Prairie Point Junction, they have a huge selection of colors as well bundles of coordinated colors. The website is http://www.prairiepointjunction.com or http://www.woolfeltcentral.com. I personally have been to the store but I know they do a ton of online business. I haven’t made stuffies but have done primitive styled projects with embroidery. I do DIY wool felt from sweaters, but then I’m lucky because Chicago-area thrift stores have tons of wool sweaters and pretty cheap. For those not so lucky, I sell large pieces and scraps in my etsy shop. I like the fact that this is reusing something too. I was pleased with the weir dolls and crafts wool felt bundles I bought; I loved being able to get a variety for not much $. They’re fairly light, but dense & easy to do detail work with (I make mostly very tiny). I do like more muted & mottled shades, though, and have to admit I’m currently using wool blends for those that I’ve picked up as yardage at Joanns and some smaller stores. I really cannot figure out why 100% wool isn’t more widely available. I love wool stuffing, too, and have this advice: find a friend with sheep! I have 3 bags full 🙂 from 3 sheep and way too much wool picking and washing. But so nice now! West Earl Woolen Mill is definitely worth the call. (This is the place mention on Mimi’s blog) I know for us super comfortable with (read: addicted to) the internet it’s odd not to have a website to order from, but their prices are really great. They are located a couple of minutes from my sister’s house and I pick wool batts up when I’m visiting her. I’d love to hear what you think if you try ’em out. thanks for that link to colonial quilts. those bundles are a deal and a half! A topic after my own heart. I have a list of sites that sell wool felt on my blog. My favorites are Magic Cabin and Erica’s. I’ve had excellent service with both. My Joann’s only carries the 80/20 acrylic/wool blend, but if you hand wash and then dry it turns into the softest felt ever. Near my town there is a farm animal rescue/adoption facility that adheres to (semi?) vegan practices. Every year when they do sheering of their sheep, they give away the fleeces, provided that you don’t use it to sell or gain profit from or anything like that. I used to be on the spinning list around here, and I think some of those ladies used to get them, though I never did. Might be something to look into. I think ours is called Oomahnee farm. Another vote for weirdolls.com-they sell their wool stuffing in bulk and it’s perfect as core wool for needle felting and for stuffing softies and dolls. I used to do traditional rug hooking (pre-kiddos), and bought yardage of the greatest 100% wool from the Dorr Mill store. http://www.dorrmillstore.com/ . I would usually buy the natural or white, and dye it myself, felting it a bit in the process. Though overdyed herringbone or other colors was great, too. So, sometimes Googling for “rug hooking suppliers” might be another way to find new resources. Oh, Thanks so much for the information! I have been looking for decent resources for felt! It’s still not as easy as dropping into the store to pick up a square or two, but at least I have them. I am still reluctant to buy yardage, but I have picked up a few colors in yard lengths–not much of a selection to improvise with, but we’re getting there! Thanks for the links. Felting thrfted sweaters? Genius! And wouldn’t it be a great way to knit up scraps of wool yarn, then felt? I love the Fair Isle felted stuffed animal. I get my wool from Rainbow Fleece Farm in New Glarus, Wisconsin. They do not have a web site, but have 2 festivals a year. A great trip for the whole family, we go to the farm, see the animals, I shop, then especially for the hubby we hit the New Glarus Brewery, the best beer I have ever had. Everyone is happy. Another source of great wool: milinery web sites. Most of is in the shape of hoods…but there is flat felt to be found. Try judithm.com, http://www.hatsupply.com, and Manny’s Millinery in New York City. This has come up before somewhere else, but Joannes DOES carry 100% wool, it is not a very wide bolt and it only comes in a natural color. It is 14.99 a yard, so whenever I have a coupon and I don’t know what else to get I buy a yard or two. Now I have yards of it stashed around my house in 2-3 yards lengths. I’ve dyed it with kool aid and it comes out great! It is very nice to work with. Remember that you can hand-dye wool fabric the same way that you’d dye wool yarn- kool-aid, or other acid dyes work beautifully. And that way you’re not limited to the colors available from somewhere like Jo-Ann’s! Hilary……..I emailed Mimi about this and I believe she’s contacted my wool guy…but… I came in contact with a really interesting fellow here in central Washington who has designed a wool shredding machine. He takes wool garments and runs them through the machine…effectively shredding them back into reusable fibers. I’ve gotten about 40 pounds of wools from him and have really liked it for stuffing dolls and things. If you’d like his contact info…..shoot me an email. His prices are fantastic ($2.35 a pound for mixed colors; $3.35 a pound for creams/whites). Wool stuffing is *THE* way to go….its so much more pleasing, aesthetically. Have a great weekend! Just posting to say that I found that A.C. Moore sells 100% wool felt now. I found it at the end of the aisle near the yarn, in a section with other felt-craft items (needles, etc.). It is sold as a rolled sheet sized 12″x12″, which, curiously, is not listed on the wrapper. The felt is from Nepal and it is quite thick. It comes in about ten colors and costs $3.50 a sheet. I picked up a couple of sheets to try it out, although I’d still like to order a selection of nicer felt from an online seller.